Today I realized that my blog have almost 100 readers! To celebrate it i decide to make an owly giveaway. The winner will receive little owl in his favorite colors, which i will make specially for him/her. Write your favorite color in the comments, you dont need to choose the colors from the picture) Write your really favorite one tone. You can join giveaway till 1 October. I love grey, yellow and pink !! Owls, my absolute favorite animal of all time. I really adore the pink one you've made! I followed your blog, facebook, and of course twitter!!! All of them are so cute! My favorites are blue and brown. I can't choose between the pink and the black one. They're both adorable! I'm a FB fan and a twitter follower. I love purple. And your owls are the best! I even created my Twitter :) LOL Blue, dark blue or blue blue blue :) Cobalt blue with blue. And my world is blue :) Love them all!!! My favourite color is green! I don't know why, probably because so much in nature is green. Thanks for the chance to win an owl! Fingers crossed. and I'm a follower of your blog!! My favourite colours are a lime green and a lovely soft purple. Plus, your owls are adorable! Right now I'm thinking purple. With a bit of silver and/or grey. subscribed to your blog and liked you on facebook and your etsy store! Creams and Beige tones or Blue tones!! Wooo! I love owls,it's amazing! My favourite color is pink,all shades and pastel purple. Also, I'm following your blog via bloglovin'. And I love your little Facebook page - such beautiful owls! I'm also following your on twitter: @gigiinstitches AND subscribed to your blog! I love bright purple and yellow together!! I love Tangerine Tango orange and Carribean blue together!!!!!!!!!!!!!!!! i am so happy i 've found your blog today!!!! 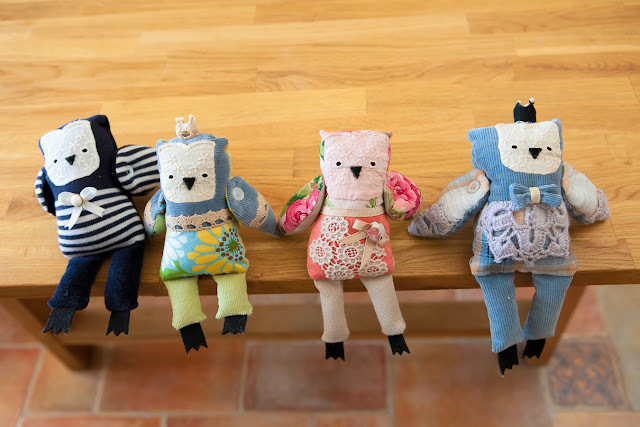 your handmade softies are all so amazing! & what a great giveaway you have here! in coral & pink in the foto! i wish you to have a beautiful day! & like you facebook page! My favourite colour is green, but I also have a soft spot for blue too. And last but not least, I've liked your Facebook page which I thought I'd have already done a while ago, but apparently I had not. Thanks to this giveaway I've now corrected that mistake. :) I go by my real name, Eerika Valkonen, on FB. I love the pale blues and purples. I love your blog and your facebook page! I love gray and brown! I read the blog and follow with GFC. it would be for my son so light blue and tan! !